Stargazing in one of the worlds largest Dark Sky Parks has hotted up thanks to a new art and architecture project. The Warm Room, a contemporary timber structure, has opened at Kielder Campsite in Northumberland for visitors to enjoy as part of their stargazing experience. 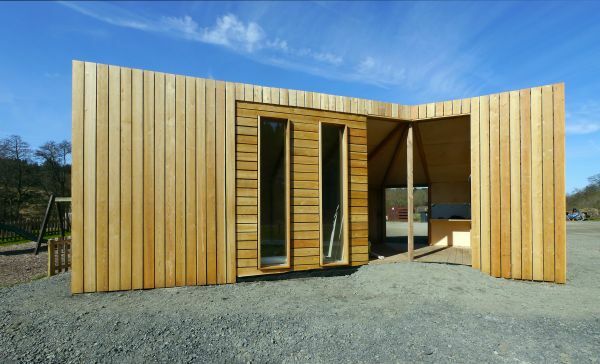 The shelter, which can accommodate up to 20 people, was designed and built by students at Newcastle University’s School of Architecture in partnership with Kielder Water & Forest Park Development Trust’s Art & Architecture programme and local residents. It provides a sheltered space and equipment charging point for stargazers who participate in overnight star camps, as well as a venue for community meetings, educational events and stargazing seminars. Campers can also make use of a sheltered external cooking area. Peter Sharpe, Kielder Art & Architecture curator, said: “Kielder Water & Forest Park has become a hot spot for astro-tourism, attracting amateur astronomers from across the country so it’s important we give people the best visitor experience and a network of opportunities to enjoy our dark skies. The Warm Room is the result of an ongoing collaboration between Newcastle University’s School of Architecture and Kielder Art & Architecture's Testing Ground programme, and follows the success of the Stargazing Pavilion constructed at Stonehaugh last year by a similar group of students. Their latest efforts add to the Gold-Tier International Dark Sky Park designation, awarded to an area of 580 square miles covering Kielder Water & Forest Park and Northumberland National Park in December 2013. Graham Farmer, Director of Architecture at Newcastle University, said: “The opportunity to work directly with a rural community has been an invaluable experience for the students and they have gained numerous transferable skills, from dealing with statutory bodies, to managing time and cost, as well as actually constructing one of their own designs. The Warm Room is part of the wider *Animating Dark Skies programme, which is supported by The Rural Development Programme for England, for which DEFRA is the Managing Authority, part financed by The European Agricultural Fund for Rural Development: Europe investing in rural areas. The Warm Room project began in October 2014 when the Newcastle University’s School of Architecture students produced a number of design proposals and then presented them to the community. Following the selection of a preferred option the students worked with residents to develop the design before submitting a planning application. The 38m2 timber-framed structure was then part prefabricated in the School. The Warm Room is a reinterpretation of the simple agricultural buildings of the region. It is clad with larch and lined with birch plywood, with two 3 metre-high windows allowing wonderful views of the Kielder landscape and sky. The well-sealed and insulated construction is designed so that the space can be heated by solar energy, occupants and light fittings without the need for additional energy inputs. Both the Warm Room and Stargazing Pavilion, part of Kielder Art & Architecture's Testing Ground programme, aim to consider the broader ecology of the building process and explore social sustainability, by working directly with communities, using local expertise or providing local training opportunities whilst also adding a direct social and economic benefit to remote rural communities.